35mm 18K rose gold case, 10.4mm thick, transparent back, 18K rose gold bezel, scratch resistant sapphire crystal, ivory dial, caliber 2653 automatic movement, approximately 68 hours of power reserve, brown alligator/crocodile leather strap, tang buckle. Water resistant to 30 m (99ft). 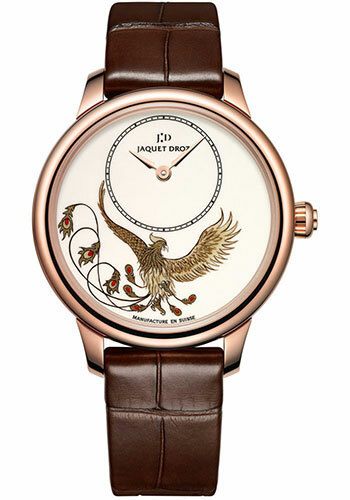 35mm 18K red gold case set with 232 diamonds (1.22 ct), 10.80mm thick, ivory Grand Feu enameled dial with miniature Monkey painting, caliber 2653 P self-winding movement with 22-carat red gold oscillating weight with monkey motif, approximately 68 hours of power reserve, brown hand made rolled edge alligator leather strap, 18K red gold ardillon buckle. Water resistant to 30 m (99ft). 35mm 18K rose gold case, 10.4mm thick, transparent back, 18K rose gold bezel, scratch resistant sapphire crystal, ivory dial, caliber 2653 automatic movement, approximately 68 hours of power reserve, satin brown strap, tang buckle. Water resistant to 30 m (99ft).